From left to right, Chief Anne P. Glavin, Captain Scott VanScoy, Jessica Luedtke (Accreditation Commission Chair, IACLEA), Chief David Bousquet (Immediate Past-President of IACLEA) as CSUN PD accepts its certificate of accreditation at the IACLEA 60th Annual Conference & Exhibition in Orlando, Fla. Photo courtesy of IACLEA. 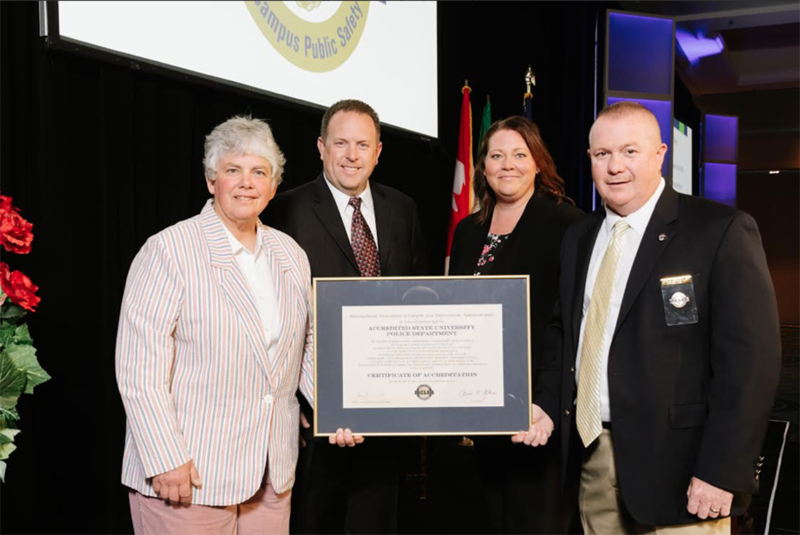 The California State University, Northridge Department of Police Services successfully achieved its third re-accreditation in June, providing independent recognition that the department conforms to high professional standards for campus law enforcement and protective services. The accreditation process was conducted by a team of assessors from the International Association of Campus Law Enforcement Administrators (IACLEA). During this process, the department had to adhere to 215 professional standards to achieve its accredited status. In the spring, the Department of Police Services participated in an on-site assessment, where all facets of the department were examined, such as policies and procedures, management, operations and support services. “The California State University, Northridge Department of Police Services has flawlessly demonstrated their mastery of the accreditation process and is found to be in full compliance with IACLEA accreditation standards for this assessment period. Their success is obviously attributed to Chief Glavin’s dedication to the IACLEA accreditation program and Captain Scott VanScoy’s experience and expertise with accreditation file management. That said, the agency’s success in this endeavor is also very much a result of the hard work of an additional 17 sworn and civilian personnel who were actively engaged in and dedicated to the accreditation process. This is how accreditation is done. The accreditation lasts for four years, during which the department must submit annual reports to show compliance with the standards by which it was initially accredited.